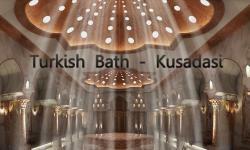 Turkish Bath in Kusadasi, Turkey offers pure indulgence where the customer unclothes to minimum and lies on the raised central platform called the Gobek Tasis or belly stone for 10-15 minutes, this is the Middle Eastern variant of a steam bath or wet sauna variant. Thereafter a professional masseur clears the skin with a loaf and washes the body and hair. Enjoy a wonderful cleansing and detoxing experience at Turkish Bath and leave feeling refreshed, renewed and relaxed, it's a heavenly hamam day spa experience.